This talk introduces a range of projects that focus on how art can better our understandings of biological augmentation, post-biological identity and the relationship between embodied data, data bodies and the Anthropocene. Studying Marine Biology, Fine Arts and a Master of Electronic Art, Stadon’s current PhD research focuses on how art can better our understandings of identity, augmentation, post-biological identity, the relationship between embodied data and data bodies and the Anthropocene and this talk will focus on these more recent projects. 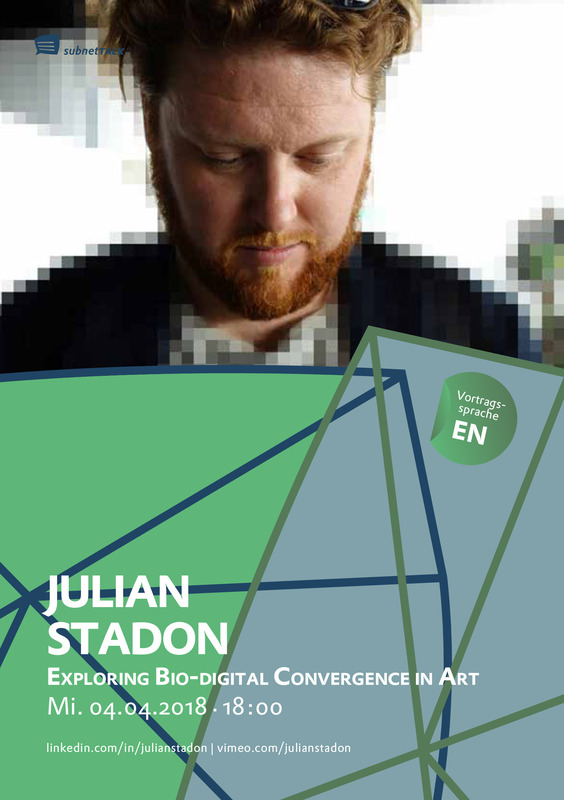 Julian Stadon is a UK based Australian artist/designer/curator/researcher/educator, Head of Digital Media Design at the University of Hertfordshire, Subject Leader in Innovative Media Practice at London College of Fashion, Lecturer at Fachhochschule Salzburg and Director of marart.org. His projects have been published and exhibited by organisations including Ars Electronica, ISEA, NASA, Symantech, BMW, IEEE, ARToolkit, The Bosnian National Archive, Residenz Galerie, Wikitude, Intel, IBM, Lumen, Pachube, BNMI, Fukuoka City Museum, The Royal Science Institute Australia, HITLab NZ, The BNMI, Media Art Histories, NOMAD Australia, The House of Vans, The Tate, Gucci and Stella McCartney.